How many times have you craved beer, bacon and cheese at the same time? Perhaps never… but it sounds good, right? Perhaps not… in fact the mere thought of it might make your arteries harden. But put aside those preconceptions – I present a combination you’ve never seen before: a nonfat, vegetarian and even nutritious combination of these 3 ingredients. A full helping of crispy, crusty, gooey goodness in convenient sandwich form. In short, this is one phenomenal sandwich. 1. Preheat a small skillet to medium heat. Spread one slice of bread with half of the butter and sprinkle with half the bacon salt. Place butter-side down in the pan and top with both slices of american cheese. Spread the other slice of bread with the remaining butter and top with the remaining bacon salt. Cover the pan with a lid or plate to aid in the cheese-melting process. 2. After about 1-2 minutes, flip the sandwich and press down with the back of a spoon. If cheese is already melted then leave the lid off, otherwise replace the lid. Cook for another 1-2 minutes or until both sides of the sandwich are browned, especially the bacon salt. Cut in half and serve. The key ingredient here is the bacon salt. You can find it online and in some stores. Otherwise you can throw some bacon bits inside the sandwich but it somehow loses some of its appeal in the process. Bacon salt??? I’ve never heard of that one. Sounds like a yummy idea to me! mmmm I need to get some of that bacon salt. oh the fun I could get into with it. Looks good! Bacon salt is awesome. I’m sorry, but this post was very disappointing to me. Fat free cheese? That stuff is more like plastic then anything else, does it even melt? Not that I have seen. And bacon salt is so loaded with chemicals and preservatives and partially hydrogentated crap. Your bread recipe is a great one, and I would cook the sandwich in a tiny bit of lard (preferably an organic one so you dont get any suprise nasties) or bacon fat (ditto the lard). You could even use smoked paprika on the inside and cook it in olive oil! To be honest, fellow Long Islander, I got hooked on fat free cheese a while back when I was looking to increase my protein intake and lower my fat intake (because I get way too much fats as it is from peanut butter) and I still love it. I’ll admit, most fat free cheeses are garbage, but there are a few styles and a few brands that provide a pretty decent product. American cheese: Kraft singles are the best, it melts great and is the least “plasticky” of the bunch. Cream cheese: the only acceptable version is the Philadelphia tub, not the foil package, and you have to whip it up really good first but then it’s delicious. Cottage cheese: I usually go for 1% because I like the no salt added for my smoothies. Ricotta: Calabra makes a good version but Polly-O isn’t far behind – I like my ricotta a little less runny anyways. As for the bacon salt, I understand the concern over the partially hydrogenated fats but considering the trace amounts involved along with the fact that people have been eating trace amounts of these fats (Skippy, Peter Pan, etc…) for ages and not melting into puddles of goo, I feel no remorse sprinkling a bit on my food. Yum! I recently made a vegan tempeh bacon to have with my toast and vegan cheezy sauce. It was tasty. I will have to investigate the cheeses you mentioned! I cant remembeer the ones I tried it was so long ago, and I am not in need of a low-fat counter balance in my diet, as I don’t eat as much PB as I imagine you do. I think I have a fear of artificial stuff and thats why I am not ready to dive into the fat free slices or the bacon salt. Which is pretty stupid since I am sure I eat other crap and don’t think twice. Mmmm. 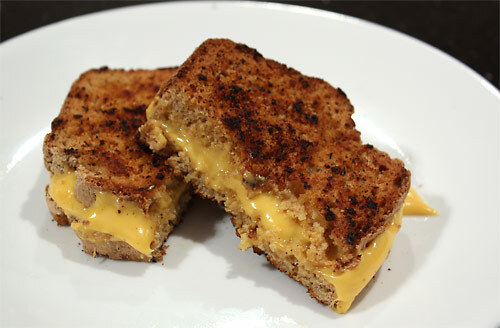 I want to make this with some vegan cheeze slices! What a great idea! I am SO sending this to my husband. it is his dream food. oh my!! bacon salt?! I have to find that stuff. Happy new year!